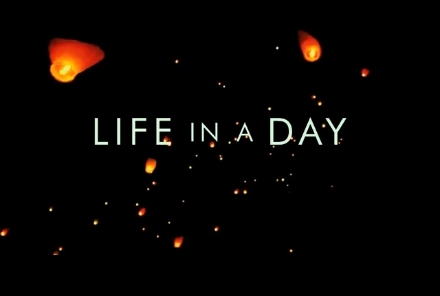 Life in a Day is a film capturing a single day through the lives of people across the planet — filmed by thousands of people and edited into a feature-length documentary. They have been showing the film across the country for the past month, after a preview at Sundance at the start of the year. It’s pretty wonderful – something I wish we would do as a society every year, perhaps with different editorial groups. The film team recently posted the clip of the young Peruvian student Abel going about his day with his XO, on YouTube, talking about life working on the street with his father, and pleased as punch with everything he can read about on Wikipedia. Abel was one of a handful of young people in Peru who were asked to submit film from their day to the crew. This is one time when I am glad to see creative groups making full use of Facebook. The film’s facebook page is the best source of new information about he film, and while we have been a casual fan of the film for some time, it was one of their updates there that pointed us to the new clip. Kudos as well for making so many of the individual stories from the film available on YouTube — please continue to do the same for the parts that didn’t make it into the movie! Last July 24, thousands of people all over the world submitted their videos to YouTube to share their lives, to participate in Life in one Day (La vida en un dia). This was an experimental bit of cinematography to create a documentary created entirely by YouTube users, capturing one day on Earth. Ten OLPC students from Peru took part, posting videos of their day for the project. Now all of the stories have been edited together into a single documentary. The film was directed by Kevin Macdonald and produced by Ridley Scott. National Geographic is helping with distribution. Rick Smolan was also involved in the film’s development last year. Since its global online premiere at Sundance, the documentary has been received enthusiastically at the Berlin and SXSW film festivals. The film will be shown in theatres across the US this summer. And here is the story of Abel, an 11-year old shoe shiner and one of Peruvian gen-XO children who took part – part of his video was included in the film, showing his life working on the street, and what he loves to read on Wikipedia. 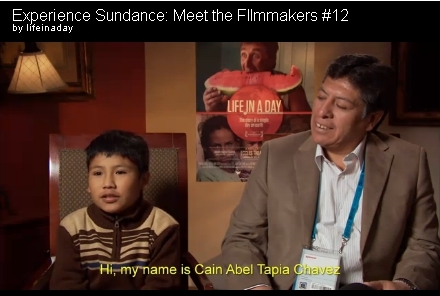 He and his father had the luck to be flown out to Sundance for the online premiere! Hat tip to Mike Massey and OLPC Mexico.